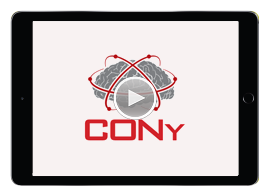 Please download the CONy 2018 app on your mobile device to gain access to event schedules, full scientific program, congress timetable, faculty biographies, industry information, exhibition floor plan, to create your own custom schedule and stay connected throughout the Congress. to create your own custom schedule and stay connected throughout the Congress. One for HCPs and one for Non-Healthcare Professionals. After selecting a login card, a disclaimer will appear and users will need to tap "Agree” before accessing the content. Please reach out to Technical Support for assistance logging in.